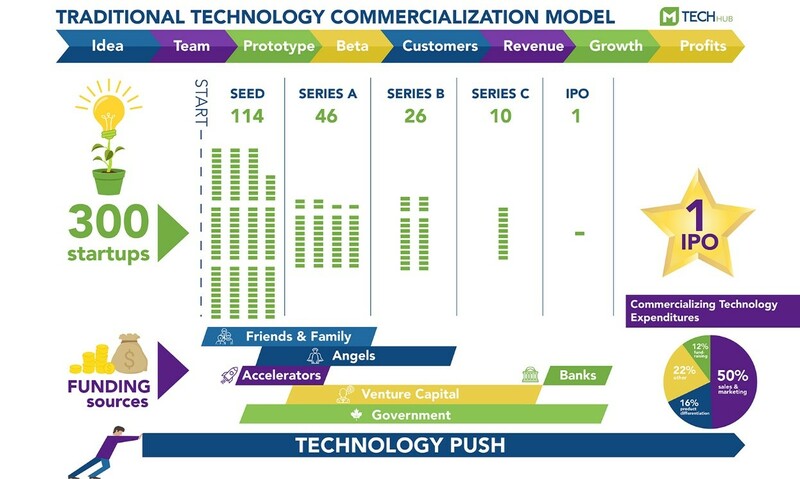 Traditionally, technology starts off as a startup and is commercialized using a “push” approach. A new technology receives various rounds of funding as the product and market mature. This is a risk-prone for technology adoption as it forces business owners to play both poker and chess when selecting technology. 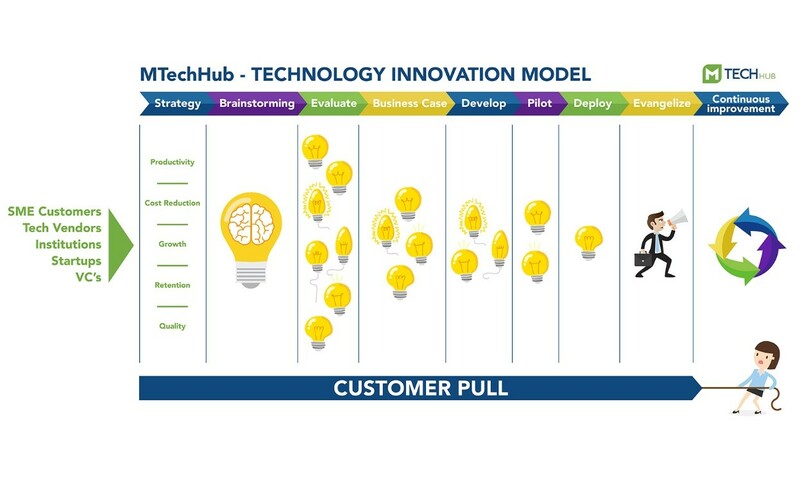 MTechHub uses a unique innovation model based on customer “pull”. Members collaborate to identify and curate ROI based technology solutions. If a commercial product fills the requirements an agreement can be negotiated to add the vendor under the buying group umbrella. If no commercial product exists, a development project can potentially be crowdfunded by the 400 membership along with some sponsorship from tech vendors. Exploiting Mobile Technology for Customers, Employees, and Suppliers. Mobile solutions are revolutionizing business. At least, that’s what 71 percent of CIO’s think, according to a recent IBM report. As businesses seek digital transformation, they’re turning to mobile initiatives to engage their customers, suppliers, and employees to reduce costs and improve productivity. With 72 percent of large manufacturing organizations planning to launch mobile apps in the next year, it’s more important than ever for SME’s to stay competitive. Why is mobile technology such an important piece of the puzzle? It’s not about the device. What “mobile” brings to the table is a complete shift in how processes are done and how users access information. Mobility is synonymous with simplification. Business processes are broken down into simple, bite-sized tasks that can be completed anytime, anywhere, without training or documentation. MTechHub is exploring this capability for outbound sales reps, shop floor personnel, field service, customers, and suppliers. According to Accenture, 88% of all customers want to track their order status online. How can you meet the needs of your customers using digital technology – from websites and email messages to text messaging, online chat, and social media? Digital technology reduces the time for a customer to get answers. Instead of visiting a brick-and-mortar location or holding on the phone for ten, twenty, even thirty minutes to speak with customer service, they can fire off an email, chat message or text message and get a response relatively quickly. Customers are embracing digital customer service. Studies show that customers who can get answers through digital customer service channels feel better about the companies they interact with. One study, for example, showed that digital customer care can boost customer satisfaction by up to one-third. At the same time, for some companies, it can help to reduce costs (perhaps by one-quarter) by eliminating call centre volume. Many industry insiders expect these trends to continue, with more companies putting their efforts behind digital customer care tools and tapering down call centre and in-person support. Tracking Technologies – RFID/Bluetooth Beacons/NFC. Billions of RFID tags are used every year. These tags cost pennies and can be attached to SKU’s, cartons, skids, tooling, employee badges, and production orders. The tags uniquely identify an item’s identity, serial or document number – data that can be read at distances of up to 600 feet. Talk about digital transformation. That’s pretty remarkable—taking an otherwise physical and non-powered item and giving it a digital identity that can contribute to the SME’s business. This is the real Internet of Things. Imagine doing a complete daily physical count in minutes or knowing the real-time location of every work order and employee in the plant. RFID can be used in your shipping department to ensure that every carton loaded onto a truck is valid and none are missed. Business Intelligence, Dashboards and Analytics. CRM, Customer Portals, IoT, and machinery instrumentation can now be producing terabytes of data every day. SME’s can now access and exploit this data in real-time to optimize business and manufacturing processes better than ever before. More importantly, insight from this data can help you identify new revenue opportunities. This transformation is changing the landscape for manufacturers, enabling them to differentiate themselves, achieve operational excellence, and disrupt markets. This project can help you optimize operations and gain that competitive advantage in engaging today’s customers who are demanding new and integrated experiences. The Internet of Things – IoT. Physical objects, such as a motor, pump, forklift or CNC machine throughout an entire factory can be equipped with sensors that measure physical characteristics of the surrounding environment. To give some examples: sensors can collect data on location, speed, temperature, vibration or flow rate. Low-power networking technology allows these “things” to share data with other “things” located in your factory or even anywhere in the world. The number of connected devices around the world is exploding — several billion connected devices are already in use today, with many more expected in the near future. These devices — smart meters and appliances, radio-frequency identification tags, connected cars, wearables and more — are producing massive amounts of data about the environment around them. The Cloud makes it easy to connect devices and collect data and enable SME’s to respond in real-time to changing information. New solutions can be deployed quickly and cost-effectively to connect to people and devices around the globe. Mobile and social networks enable people to work in a smarter way by putting more real-time information and decision-making power in the palms of their hands, with everything integrated securely in business processes and workflow. Map your Customer’s Buying Journey. Companies like Amazon, Uber, and Airbnb successfully leveraged new technology to disrupt their industries by making life easier for their customers. Digital can go beyond just providing superior customer experience but to create new business models, drive operational excellence, and enhance employee engagement. A first step when embarking on the digital transformation journey is to map the buying process of your customers. A journey map identifies your customer’s expectations, experiences, and reflections as it unfolds over time and across multiple stages and touchpoints while buying and using a product or service. New digital tools can be used to create a much deeper understanding of your customer’s buying process. By capturing the current “as is” state of a customer’s journey — in this case, the booking of an airline ticket — the map amplifies various pain points along the purchase path. For experienced designers, questions that arise around the journey include the following: Do we know the customer’s context? Is the information about the various options adequate or even relevant? Are there too many details to be filled out multiple times? Is the whole exercise too time-consuming? Capturing the “as is” state can also predict likely future behavior. A customer journey map enables SME’s to prioritize the aspects of their business to focus on, which technologies will be required and what new business models they can create. Investments, technologies, and business models can be aligned more effectively with customers, employees, and suppliers. The journey map help SME’s understand customer decision-making inclusion emotions and other factors that influence their buying criteria. Fulfilling the Promise of Hybrid Cloud. MTechHub has a fully deployed Hybrid Cloud deployed for member trials and testing. To succeed in Digital Transformation SME’s require a flexible digital infrastructure so they can adapt to a rapidly changing and global environment – without breaking the bank. There is a need for faster, more cost-effective access to IT resources. Currently, there are tradeoffs to both Public Cloud and On-Premise infrastructure. There are advantages to operating customer and sales rep applications on the Public Cloud. There are advantages to operating large file applications like CAD using an On-Premise server. The new generation of hybrid infrastructure enables you to connect your Cloud and On-Premise systems and get the best of both worlds. Proper Application design and virtualization enables you to deploy and manage applications to best meet the needs of your business while maintaining the highest standards of performance, availability, security, and control. Seamless interoperability gives you the freedom and flexibility to securely move applications and data between your on-premise and cloud environments as requirements and economics change. This interoperability eliminates service provider lock-in so you can constantly reduce costs and improve performance as technology evolves. The ability to easily move workloads from A to B is a prerequisite for your Digital Transformation journey. MTechHub is constantly evaluating the economics and performance capabilities of all the components of Hybrid cloud technology so you can easily deploy the current best practices. MTechHub bargains collectively on behalf of their members to ensure SME’s get discounts comparable to government or Fortune 500 organizations. Collaboration used to be something that happened within a department or a cross-functional corporate team. Twenty years ago groupware such as Lotus Notes was used for this. Periodic handoffs no longer suffice. Now, collaboration stretches across the customer base, employees, and down through the entire supply chain. Team members can be located anywhere. Various technologies have sprouted up to support this including Google Apps, SharePoint, Office365 and DropBox, and others. The cloud and mobility have facilitated this. Empowered collaboration extends well beyond documents and projects. Now everyone can view the same information and interact using various messaging and communications methods. As more and more of activities become digitally connected, cross-functional collaboration capabilities that were not previously possible are emerging. Engineering can rapidly incorporate feedback from field service can double or triple the rate of product improvements. Functional roles overlap and blur. A connected collaboration loop can be created between marketing, product management, and the filed teams exploit this convergence. The improvement is continuous and never ends, even after the sale. Harnessing collaboration is absolutely fundamental to the success of digital transformation and this uses technology platforms to change how your company is structured, managed, and organized. Getting the right mindsets, skillsets, and culture in place is equally crucial. Where do you start? Video Conferencing, SmartBoards, Project Software, or Document Management? Come out to MTechHub and see what we have put together – help us make it better! Unified Communications and Collaboration (UCC) provides a single interface for an immersive experience using all types of communication including text, voice, video, and virtual whiteboards. Quickly schedule and create a stakeholder video conference to rapidly review critical issues. Brainstorming and presentations with an engaged team can be a great experience using seamless UCC that enables many different interaction methods. Attendees receive effective communication of multifaceted concepts. Manufacturing companies face a number of challenges every day, many of which revolve around collaboration and communication. Unified communications (UC) can bring measurable and quantifiable cost savings by improving workforce productivity and improving customer satisfaction with more responsive service. Efficiency and high productivity enable manufacturers to better meet increasing customer expectations while managing costs and supply chain processes. Today, information—immediate, current, and actionable—is the most important element of profitable manufacturing operations. SME’s need a proven, cost-effective voice and data products to support innovation, collaboration, and meeting solutions. MTechHub has assembled standardized video and voice conferencing, and meeting solutions that enable people to easily meet in real-time—with the push of a button. This enables you to collaborate and share information across functions, departments, and geographical boundaries. You can easily respond to customer demands, gather product feedback, and accelerate response times. Meeting participants can greet and communicate as naturally as if they were at the same table—no matter where they are. Come to MTechHub and see how people can quickly share information, find answers and collaborate in real-time—easily, immediately, and cost-effectively. Employees to listen to e-mail messages over the phone using text-to-speech translation capabilities. They can access voice and e-mail messages from one inbox. For maximum flexibility, people can use the messaging tool that is most convenient at the time. Open a CAD drawing, Illustrator file or software application. Share a video of an operating production line. Pull in experts using their laptops or mobile devices. Identify the issue, approve the change – get a game plan – everyone is in the loop. Customer Engagement Digital Transformation drives customer engagement. SME’s can use digital technology as a competitive advantage to fuel new revenue sources while ensuring customer loyalty and satisfaction. MTechHub practitioners are focused on the technology required to meet customer expectations. The top customer expectations for digital transformation efforts today include dramatically reduced response times and immediate real-time access. Customers expect the active management of their history and preferences so they can easily engage with you using mobile, email, SMS, web, social media or face-to-face communication. Come out to MTechHub to see how to use IoT to reduce energy costs and improve security. Control HVAC, lighting, security cameras, access control and door locks, alarms, PA systems, and alarm buttons. Monitor building status and security alerts from a mobile device. To successfully compete in this increasingly digital world, SME’s need to transform their slow, error-prone operations from manual, analog processes to automated digital workflows. MTechHub is working hard on to transform your common processes done on paper or in spreadsheets, to a fully digital process. As SME’s embark on digital transformation, they need to consider the people (their skills and backgrounds), the processes (have they made them digital or they still doing things on spreadsheets? ), and the technology (to enable the company to be more digitally oriented). Digital workflows can improve the way people. For example, if you introduce a digital expense claim workflow you may want to manage compliance submittal dates, approval, and payment times. You could see the average expense claim trend. This is a simple example of how you can digitize a manual process. You can be more productive by eliminating inefficiencies to decrease costs.